We eat a LOT of Mac and cheese, no seriously, a lot. I usually double the recipe because there are always a lot of kids at my house and everyone loves a bowl of mac and cheese and they always go back for a second helping. This recipe comes from The Two Bite Club. I am always trying out different recipes and using the kids as my tasters to vote for which recipe they like best, this one was inhaled and it looked like the dishes were licked clean. I think that is a great indicator. 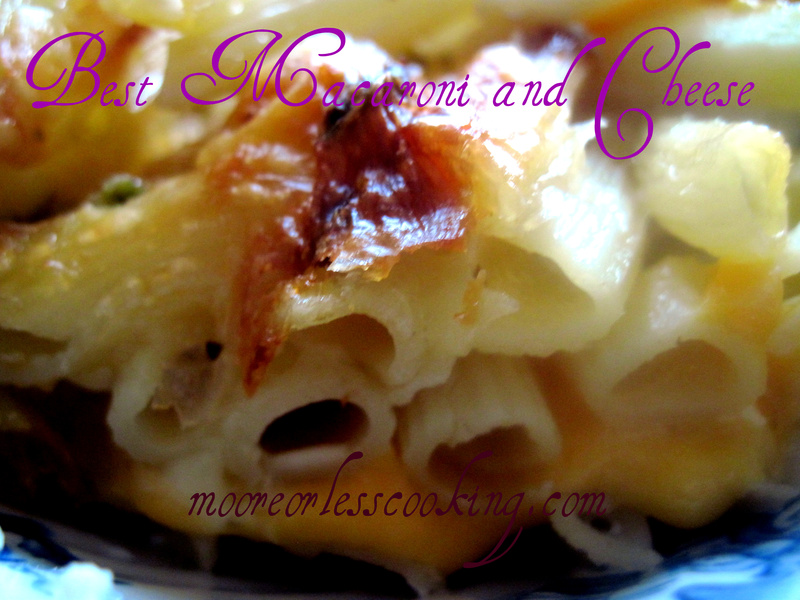 Best Macaroni and Cheese, pure comfort food. Such an easy recipe! Spray a 9 x 13 baking pan with non-stick cooking spray. Layer ingredients in the following order: half of the macaroni, half of the cheese, the remaining macaroni, followed by the remaining cheese. Pour milk over layers until the milk fills the dish about ¾ of the way full or until you just see the milk coming through the macaroni when you're looking at it from the top. Bake uncovered in preheated oven for 50 minutes to one hour or until the top is golden and bubbly. Let sit 10-15 minutes before serving. Serve with warmed stewed tomatoes. Copy and paste, then select the text and change the font color. hold down left side of mouse, with the cursor at bottom of recipe, and move it up over the recipe, the content will highlight blue. Remove finger from left side of mouse and right click. A window will come up, right click on copy. Now you can copy it to anywhere mircrosoft word or your FB page. Put your cursor on where you want to place the copy..right click, window will come up..left click on paste..DONE.. THIS is the mac and cheese we grew up with. Wonderful, total comfort food, none of that saucey stuff. (good but not the real thing) If you’re in a hurry, warm the milk before pouring it on; that will speed it up a little. For a tiny bit of zip add a little dried mustard to the milk. Use one cheese or mix whatever you have on hand, use elbow, rigatoni… It’s epic! I will try it Liz! Thank you for the tip! Don’t like tomatoes in my mac and cheese. It’s a personal preference, some people do, some people don’t. I was raised eating macaroni and tomato juice. G’day and uber yum! This is my all time fave comfort food! Delicious photo! I just tried it! It’s great! So simple to make, I’m going to show my granddaughter how to make it. Thanks!